As a disclaimer – this is not a paid blog. The opinions expressed are my own, and are not informed by any sort of compensation by any company mentioned. If I like it, I talk it up. And if it’s horrible, I try to warn you. So on with the show! I’m having a love affair with the place that we live: Portland, Oregon. My family moved here from Las Vegas when I was seven, so I feel like it’s my hometown. If you aren’t familiar with the geography in the Northwest, we are triply blessed with access to snowy Mt. Hood 60 miles to the East, the high plains dessert of Pendleton 150 miles east, or Bend 160 miles southeast, and the Pacific Ocean is only 75 miles West of Portland. And of all of the beautiful places I’ve seen during my lifetime in Oregon, my favorite natural attraction to visit is the Oregon Coast. Since I quit my paying gig four and a half months ago, I’ve taken Zoe on day trips to the coast eight times. From where we live, on the west side, it’s a 90 minute drive to the Pacific Ocean, and the highway winds you through towering pine trees or beautiful rolling farmland, or both. We’ve targeted the Northern Coast for most of these trips, namely Cannon Beach and Tillamook, due to their close proximity and a recent addiction I’ve developed to Misty Meadows Marion Berry Jam and Blue Heron Brie. This week, gauging my jam jar capacity at only 20%, I was tempted to drive back out to Tillamook to restock, but I was feeling adventurous, so I checked TripAdvisor for fun things to do in Astoria. I haven’t been there in years and I thought I remembered some cool stuff to see there. Between the awe-inspiring bridge to Long Beach, the old-time Trolley, and the Goonies House, I was sold. Getting Zoe to agree to an adventure, especially when a Trolley is involved, is easy as pie. In our previous treks, I’ve learned some tips that help make the day a success. We start our day off with a good breakfast, and I spend a few minutes packing a cooler with healthy snacks: Lots of cut vegetables, hummus, bread and butter, apple-sauce (in cool re-usable containers we found on Amazon), grapes, and string cheese. Then I check the diaper back for extra shoes, socks, and at least one change of clothes, oh yeah, and plenty of diapers! Since we are visiting the Oregon Coast, not somewhere exotically warm, I typically leave the swimsuit at home because at most we’ll just dip our toes in the ocean. I also keep a big bag of beach toys and our giant beach towel (blanket) in the car so it’s always ready. On a good day, we hit the road by 9am, but we have left as late as 10:45 and still had a great, if later day at the beach. This week, we hit the road at 9:50, and that included a quick drive in reverse back down our cul-de-sac so I could pick up some tunes for the ride. We could have headed west to Seaside, then North to Astoria, but it was an adventure day, so we headed East into Portland, (you know, the opposite direction of the ocean) to take I-405 North to HWY 30. It’s a solid 2-hour drive, but you flank the Columbia River and get to see some gorgeous bridge views. We even passed through a little blip on the map – Burlington – with a tavern and a strange old house. Here’s a more impressive pic than I was able to get – credit to msphotopdx. 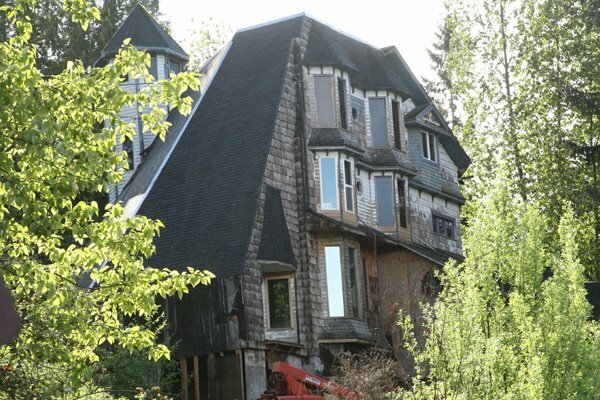 I was disappointed that I couldn’t get closer to it to check it out, and I’ve since googled it, gone to Portland maps, and been a cyber stalker trying to find additional information about this house. 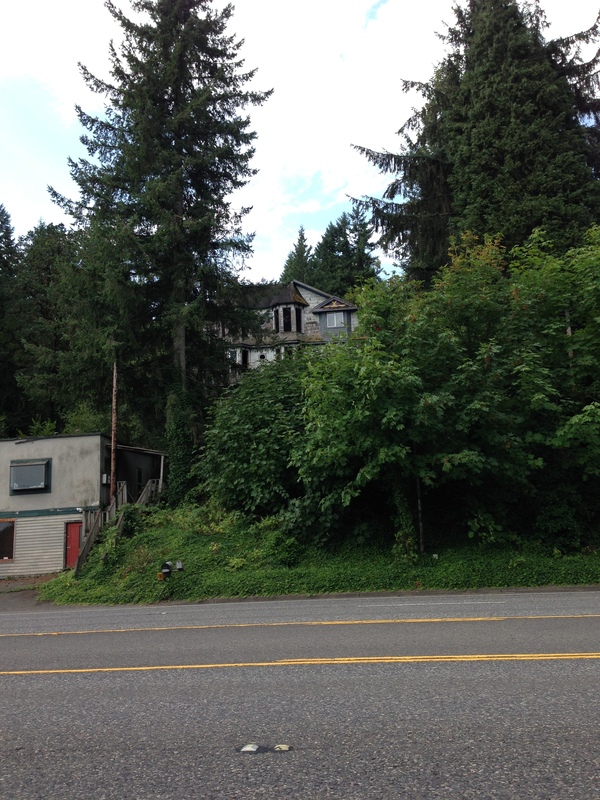 The story behind this house might make an interesting blog post someday; we’ll have to see if my sleuthing pays off. But back to our adventure day! Continuing Northwest on HWY 30, we enjoyed the scenery, including the awesome view of the Longview Bridge. It was as impressive as the pics of the Astoria bridge to Long Beach, and I’m tempted to make another adventure of driving across some of these further bridges on another day. By the time we hit Astoria, Zoe was ready to walk off her wiggles, but we took the time to cross the Astoria-Megler bridge – a whopping 4.1 miles in length! Fortunately for me, we found a rest area just one mile down the road, and spent a little time smelling the flowers before we came back across the bridge to experience the rest of Astoria. Since Astoria is the northernmost beach town in Oregon, I thought I’d take the opportunity to tell you a little about our favorite things to do and see at the different beach towns we’ve visited in the recent past. This is not an exhaustive list, so feel free to comment on your favorite attraction or town, if I’ve left it out! Astoria – Astoria is technically a river town – it sits at the mouth of the Columbia River, and it’s history is rich with river culture. 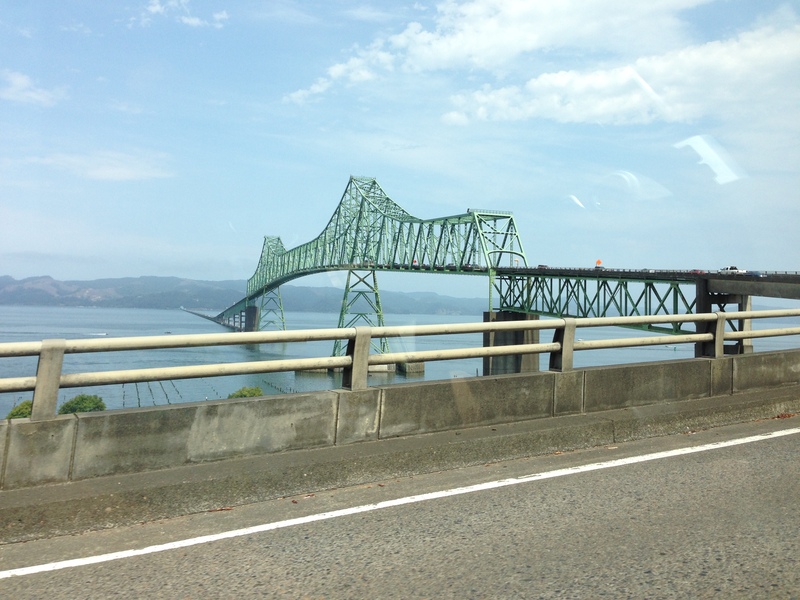 Definitely cross the Astoria-Megler Bridge! We also took the Astoria Riverfront Trolley (summer hours only) for a buck each, and enjoyed the old time entertainment and the two conductor’s friendly patter. 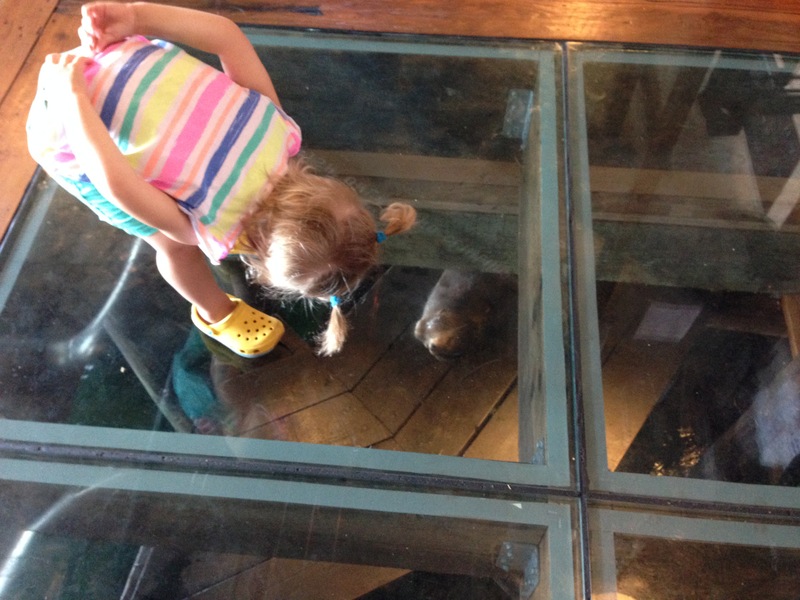 The River Front also boasts many Breweries – we stopped at Buoy Beer Company and Zoe enjoyed peeking at the well fed sea lion napping underneath the restaurant! But since we waited 30 minutes for a seat in the late afternoon (on a Wednesday) and we shared a mediocre cheeseburger with disinterested service (sorry Buoy), I will try another brewery/restaurant the next time we visit. 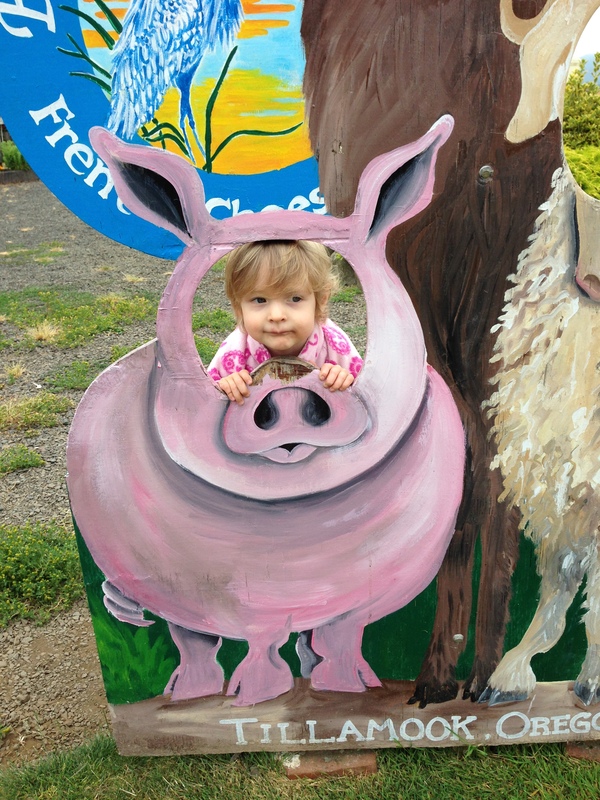 Seaside – 18 miles south of Astoria, this town has a bustling tourist feel, and has something for the kid in all of us. Generally, we take HWY 26 west from beaverton, and we arrive in less than 90 minutes. Seaside boasts a Tilt-a-Whirl, Bumper Cars, a Carousel, Pronto Pups, ice cream, caramel corn, and fudge, all centrally located on Avenue A – the main drag that leads to a turnaround in front of the ocean. Seaside also offers a wide 1.5 mile Promenade that showcases beautiful views of the pacific ocean as well as gorgeous views of some of the grand beachfront homes in town. The turnaround provides easy beach access with public bathrooms and foot washing stations – handy if to clean both two or four-legged friends. Seaside also hosts an outlet center, a well stocked Safeway, and a small aquarium. It’s a busy beach town, especially now that the WorldMark timeshare is open at the south side of the turnaround, but if you want a party feel to your summer beach scene, and a town with lots to see and do, Seaside is the place to be. Cannon Beach – Just 8 miles south of Seaside, Cannon Beach is also exceedingly popular. It has an artsy vibe and is full of galleries and shops showcasing painting, photography, blown glass, and driftwood art. 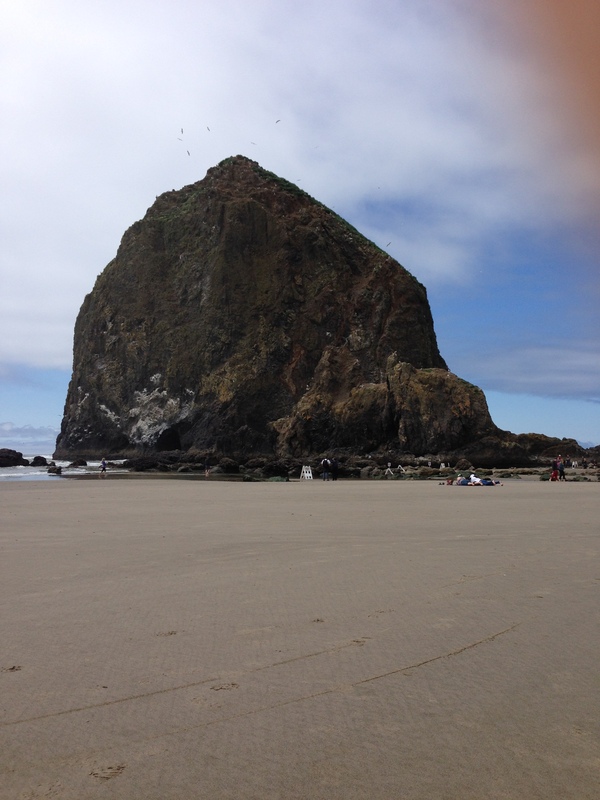 Cannon Beach is also the home of the monolithic Haystack Rock. Zoe and I took a particularly memorable walk from E. 2nd Street, on the north end of town, to the Rock, and back. The day was beautiful, the company was adorable, and the walk logged us 4 miles on my pedometer! The pink haze in the photo below is my thumb, I’m sorry to say I bungled both shots of the rock on this visit! This is one rock to visit on the Oregon Coast! It’s beautiful, photo-worthy, just get your thumb out of the way, and a great place to take the kiddos. Safety alert: the ocean is powerful near the rock, and they warn of sneaker waves so take the kids into the ocean farther north or south of the rock. To protect the habitat it provides to sealife, the City of Cannon Beach and the Friends of Haystack Rock provide information at the rock during low tide. A Lifeguard is also on duty! Hemlock is the main street that winds through town. The North end is very walk-able, full of cafes, shops, and galleries, and beach access is available at most roads end. Parking is hard to come by on the weekends, but there are public lots on Spruce, one block east of Hemlock. And I want to note how dog friendly Cannon Beach is. Shops leave out water bowls, some provide bow-wow treats, and there are many dogs walking or riding bag-side their people. We love Cannon Beach for wide sandy beaches, sunny skies when you are lucky, Bruce’s Candy Kitchen, with views of the candy making action, and a good selection of beach eats. 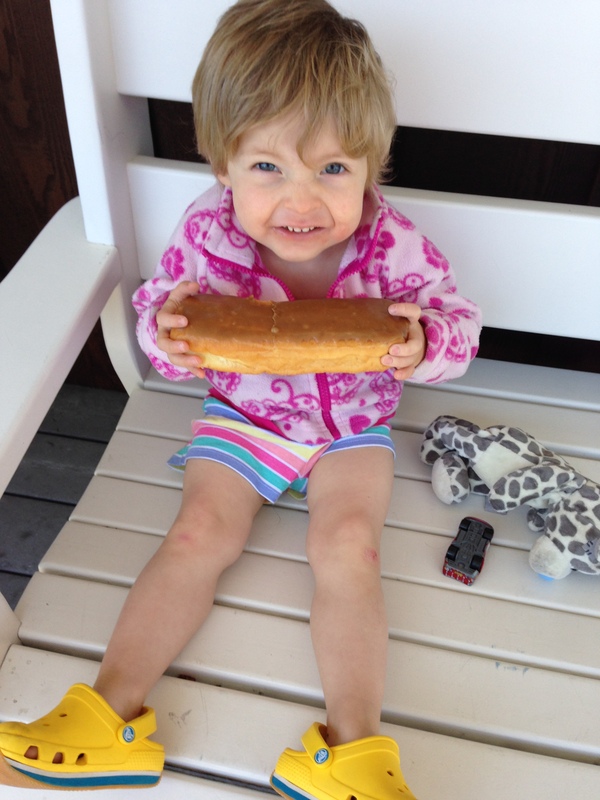 Don’t miss the Cannon Beach Bakery – my favorite are the bear claws, but this visit we opted for a donut to share – check out the size of their maple bars. Cannon Beach is also home to my favorite restaurants on the coast: Newmans at 988 call for reservations, it’s a small yellow house near the south end of town. Get the crab cakes – they are all killer, no filler. Tillamook – 40 miles south of Cannon Beach, and home to the Tillamook Cheese Factory, a top tou rist attraction in Oregon for it’s second story views of cheese making and packaging in proces and its huge cheese and ice-cream shop. It was here that I purchased a large jar of Misty Meadows Marion Berry Jam – the best jam I’ve ever tasted! They sell this stuff in small jars at the Made in Oregon store – pick some up, and then tell me what you think! We also visited Blue Heron French Cheese Factory for the first time this year – they have goats and chickens on site with small bags of feed for sale, plus a store of the most fantastic samples of mustards, dips, and of course their signature Brie. Unfortunately, this stay at home mom has developed a fondness for their Smoked Brie and Dill Mustard! Zoe loves to watch me feed the animals and then declares ‘I fed the goats’ to anyone who will listen. Some day she will actually do it, so until then, we have lots of reasons to go back. Tillamook itself doesn’t have accessible beaches because it’s so far inland, so take HWY131 to Netarts or Oceanside. And lighthouse enthusiasts shouldn’t miss Cape Mears. I love the drive between Tillamook and Cannon Beach. Hitting Nehalem bay from the south is one of the most scenic trips you can take in a day in Oregon. Lincoln City – 44 miles south of Tillamook, and in the center of the coast, we drive 99 South through McMinnville or take I5 South to Salem, and then HW22 to HWY18. Since it’s a two hour drive, we don’t do day trips here, but it’s worth an overnight visit, especially if you are seeing other towns and sites further south. Famous for it’s Kite Festival, Lincoln City is a long Beach town with beautiful coarse grained white sandy beaches, a large set of Outlet stores, and lots of overnight and dining options. HWY 101 goes right through town, so it seems busy, but get out on the beach and enjoy the wide flat ocean access. Depot Bay – 12 miles south of Lincoln City, Depot bay calls itself the Whale Watching Capital of the Oregon Coast. It’s also the worlds smallest navigable harbor, according to their chamber of commerce. Depot Bay is a small town, you can pas through it in less than a minute, but it’s worth a stop at the Whale Watching Center during the spring and summer. They track whale sitings and have an unparalleled view of the ocean. Sidewalks on the Ocean side of town can get blasted by ocean water during storms, but find a dry spot and check out the waves hitting the rocky coastline below the town, it is an awe inspiring view. Gracie’s Sea Hag has great clam chowder, and the Spouting Horn, closed in June during our last visit, is under new management, so we’re hoping for good things when we return. Devil’s Punch Bowl State Park is less than 6 miles south of town – check out this natural wonder, and hold on to your littles. 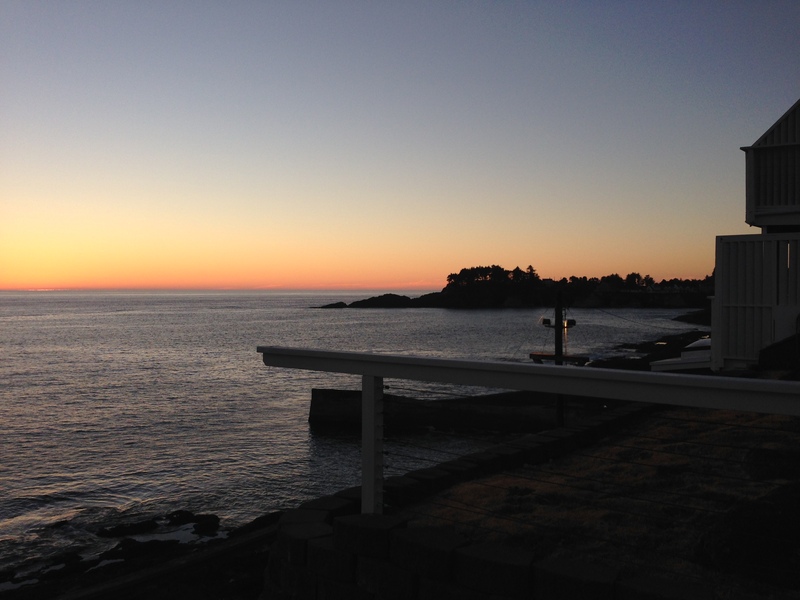 Newport – 12 miles south of Depot Bay, Newport is another large seaside town that is also situated on a bay. Oceanside, public beach access is available at Nye Beach, with public toilets and white sandy beaches, plus close access to cute shops and cafes. But be sure to visit the Historic Bay district for the complete Newport experience. If you’ve never been, you can visit the expensive and tourist-trappy Wax Museum, Ripley’s Believe it or Not, and the Undersea Garden. Or skip those, cross the street to the bay side, and step out on the dock to talk to the Sea Lions that hang out on the floating docks during much of the year. The bayside also has a lot of restaurants, cafes, and ice cream shops. We like Gino’s on the West End of the bay for decent and reasonably priced lunch fare, but I prefer the popular Local Ocean Seafoods for a nice dinner and view of the bay. Yachats – 34 miles south of Newport, Yachats is a unique Oregon Coast experience. Instead of sand, Yachats has beaches of tiny pebbles, full of tiny agates, sea glass, and beach rocks. We like the vibe of The Drift Inn for great breakfast, lunch, or dinner. Peek your head in for their gift shop and fantastic umbrella decor. They also have live music! Drive south 2.4 miles and check out Devil’s Churn, for some more amazing Oregon Coast scenery. Another 12 miles south are the Sea Lion Caves, which deserve a look if you’ve never been. So now you have it – my recommendations for a great day trip, or longer, to the Oregon Coast. I hope you’ll post places YOU love to frequent when you visit, and that will give Zoe and I some new ground to cover. Have a great day! Nice post about our beautiful beach towns! As I was scrolling down I hope I’d see Coos Bay, where our oldest son lives. 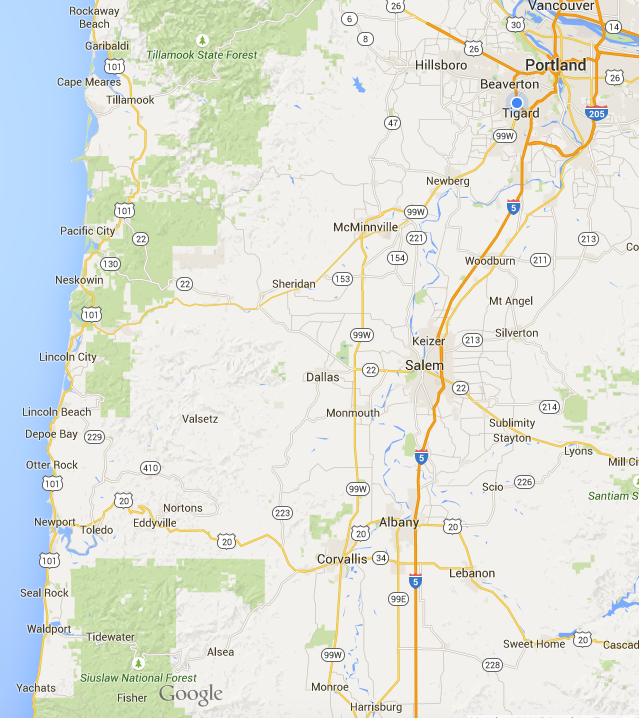 But I know it is pretty far south of Portland – 4 hours; too long for a day trip with a kidlet! So true, Howard, it looks like a long drive on the map. 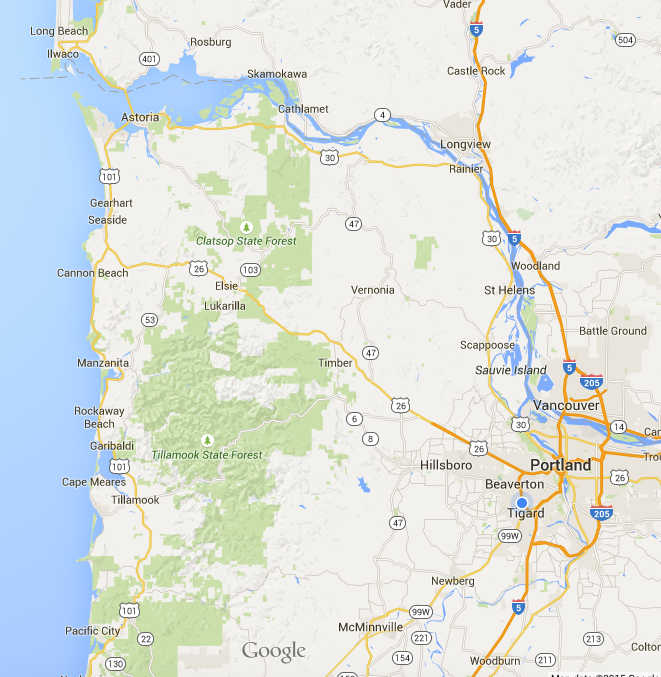 I’ve never been to Coos Bay – even pre kiddo! 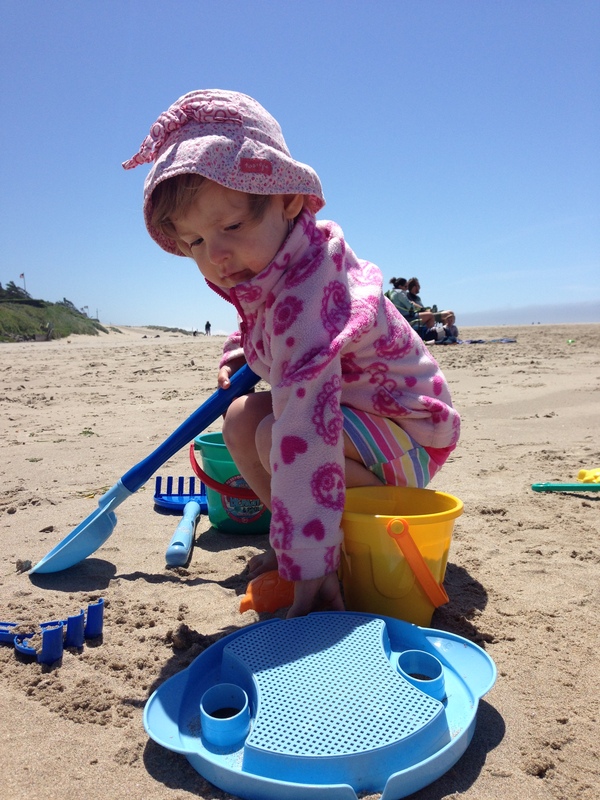 Besides seeing your son – what are your favorite things about visiting Coos Bay? Yes! So Zoe and I make an open invitation – any time you have a free weekday, let us know, and we can all go! 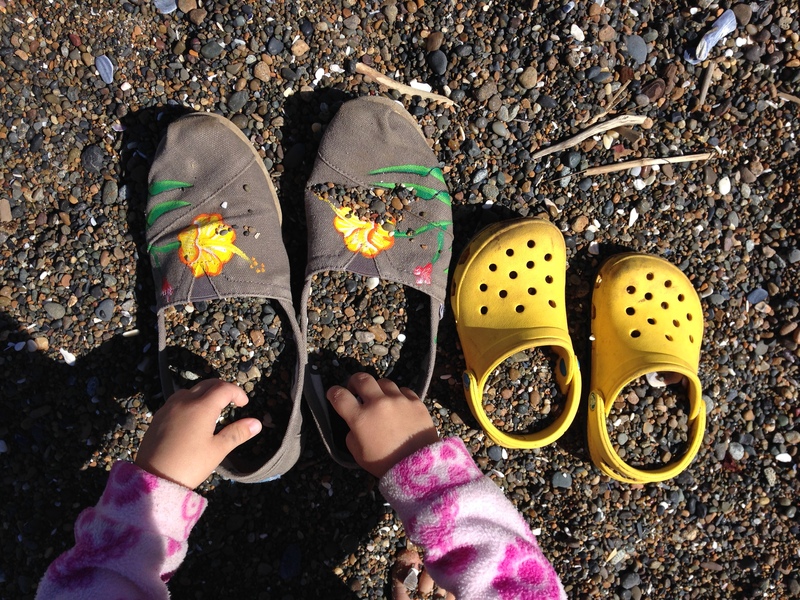 Well, Young Lady, You’ve hit some of our favorite spots on the OREGON COAST. I think the coastal “gem”, to us, is the Yachats area — we spent our 50th anniversary in the Light keepers house at Heceta Head, a place to remember. Another thought for the “Adventuring Mother”, back up North, from Astoria, crossing Young’s Bay, take Hwy. 47, allowing 2 to 3 hours, passing wild state game reserves, thru Jewel and Mist, and at a junction, decide to come out at Scapoose (Hwy 30) or thru Vernonia (Hwy 47) intersecting on Hwy. 26. NOTE: Hwy. 47 is narrow, take your time. Your Blog is GREAT !!! Thanks for the tip on HWY 47! I saw signs for Jewel and Mist and thought they’d be worth a visit for their names alone! Glad you and Coleen love Yachts too – great minds think alike!